A full color 320 page book featuring pictures of bonsai, split into the seasons New Year, Spring, Summer, Autumn and Winter. The text is both in Japanese and English. Mr. Kunio Kobayashi is the curator of the Shunkaen Bonsai Museum in Edogawa, Tokyo, and is one the leading bonsai artists and is acknowledged not only in Japan but also internationally for his outstanding skill and craftsmanship. 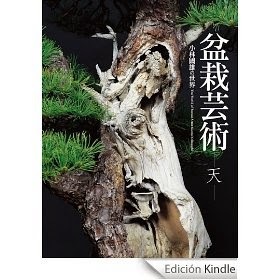 In celebrating his sixtieth birthday he has created this book to commenerate his 33 years as a bonsai artist. I his own words "through Bonsai I have been taught many things, they display the beauty of nature in all four seasons and the majesty, grace and power of trees surviving in the harshest of conditions; something which helps me in my life. I have been doing Bonsai for 30 years and love it so much that I have created a museum to display Bonsai. It is my wish to spread the beauty of Bonsai worldwide, to do so I try hard to teach the art to my apprentices from Japan and from the rest of the world." Awards & Commendations: Japan Professional Artist Exhibition - Prime Ministers Award - 1989, 92, 99, 2001 - Ministry of Education Award - 1994, 96 - Ministry of Agriculture Award - 1995 - Ministry of Environment-2000 - Mainichi Newspaper Award - 1997 - Japan Full Bloom Award (Satsuki) - 1985, 90 - Japan Bonsai Association Award-1998 - Shohin-2003.